Spina, the long-sought Etrusco-Greek city in the Po Valley. The grid of canals and city blocks was neatly sketched in lighter and darker shades of marsh grass. Note the wide black strip top left, which represents the principal port canal. 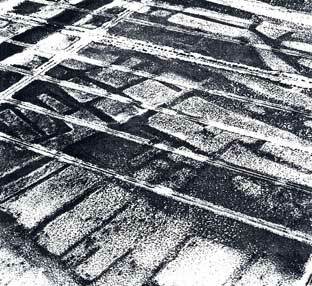 Superimposed white parallels belong to modern drainage system.